Originally announced as the Centris 660av in July 1993, The Quadra 660av got a name change in October, when Apple phased out the Centris name, and was one of the first Macs (along with the Quadra 840av) to integrate audio-visual features into it's basic design. It came in a Centris 610-style low profile case, and was driven by a 25 MHz 68040 processor, with a 55 MHz AT&T 3210 Digital Signal Processor. 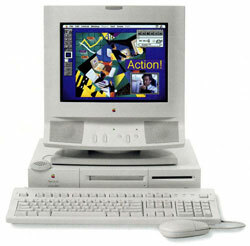 The 660av was also one of the first Macs to include Geoport serial port (the modem port), which could be used as a modem with a telecom adapter. The 660av had s-video and composite video-in and out, and was originally priced at $2300, making it Apple's first low priced AV option.